Viking Garments were decorated with colorful embroidery. You can embellish your costume with authentic, easy stitches. Viking or Norse garments were extremely practical and comfortable to wear. 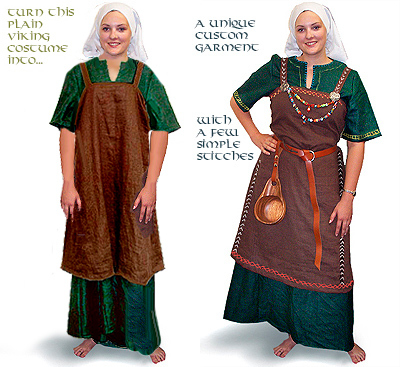 The Norse wove clothing from wool, linen, or occasionally silk. Women usually wore two or more dresses depending on the weather. When it was warm or if they were working near the fire all day, they wore an apron dress (hangeroc or smokker) over a short sleeve gown (gunna) of linen. For cool weather or evenings, they also wore a long sleeve chemise under the short sleeve gown. For really cold weather they wore multiple layers of linen and wool. Wearing linen next to the skin was preferred for comfort but they also made undergarments of lambswool. The Norse wore heavy, fur-lined coats and cloaks with hoods. The men wore wool, fur, or leather caps, and the women wore little cloth hoods, caps, or kerchiefs and in non-Christian areas they also wore their hair uncovered. There is evidence that they embroidered their garments over the seams and around the edges with stitches from the "backstitch family." These simple stitches include the "Backstitch," "Stem Stitch," Herringbone," and "Blanket Stitch." They embroidered with silk, linen, wool, and metallic wrapped silk threads. Felt appliqués, card-woven ribbons, braided cord, and wire passimenterie were also used to decorate Viking garments, especially the gowns. 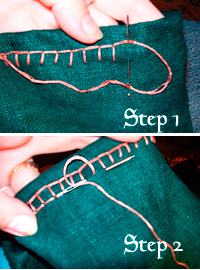 You can express your creativity by embroidering your own Viking-style garb, in just a few evenings, using these simple stitches. I learned many of these stitches as a child from my grandmother who made quilts, now I use them to decorate Viking gowns, shirts, aprons, and hats for myself and my friends. Linen is a slick fiber that allows the needle to pass between the threads effortlessly, making it possible to use blunt tapestry needles with large eyes. I prefer them because they are easy to thread and won't prick your fingers. I use DMC cotton thread because it comes in so many colors and is easy to find, but I have also used wool, silk, and acrylic yarns when I've wanted a bolder look, especially on wool garments. When you are using DMC thread, you can use all 6 strands for big, bold designs, or split the thread into two pieces of 3 threads each for more delicate stitches. Cut your thread into pieces the length of your arm, about 24" to 28", and thread two or more needles at a time. I pin the extra needles to a square of cloth pinned to my chest so I don't lose them. Sometimes I thread 6 needles with the same color so I won't have to stop while I'm working. The things that make this style Viking embroidery is the way it is worked—without a hoop—and is principally worked over the seams. Originally the seams were flat felled (like the inseam on jeans) and the embroidery stitches finished the seams. BACKSTITCH/Stem Stitch: Before you begin, draw a thin chalk line around the neckline or sleeve to follow. Knot the thread by wrapping one end of the thread around the tip of your finger and rolling it off, or make an anchor stitch to secure the end of the thread to the back of the garment. Don't knot both ends together or you won't be able to correct your mistakes without cutting the thread. Start the first stitch with the needle coming up through the fabric one step to the left of the line you want to backstitch. Then insert the needle point on the chalkline, one quarter inch to the right of the base of the thread. Holding the needle horizontal to the surface of the fabric, make a long stitch underneath so that the needle's point comes out one quarter inch to the left of the base of the thread on the chalkline, as in the picture. Continue in this manner, spacing the stitches as closely together as you can and keeping the length of each stitch consistent until you reach to the end of the line. Notice how every stitch goes in and out of the fabric on top and you never have to pull the thread underneath unless you are tying off. 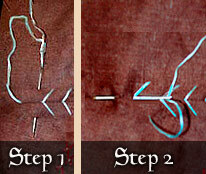 All the Viking embroidery stitches work this way. Grabbing the needle underneath is a hard habit to break if you are used to Cross Stitch or other forms of embroidery that use a hoop! the thread under the needle. stitching on the hem as a guide. Use backstitching alone for outlines, or you can make parallel lines in contrasting colors, or even team it up with other stitches to create interesting variations, (see Viking Box Stitch). 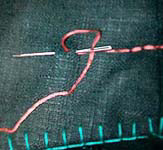 Stem Stitch is closely related. It is basically the same as Backstitch but worked tighter so each stitch overlaps a little. The Norse were very fond of stitches that were worked in two journeys or with two needles to create twisted stitches You can get this look by working a Whip Stitch over Backstitch or Stem Stitch in a contrasting color. 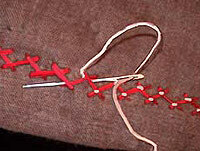 BLANKET STITCH: This stitch is used around necklines, cuffs, and hems. If you are decorating the neckline of the Viking Short-sleeve Gown, poke the needle under the facing seam starting at the center back so that the knot is left between the layers and the thread is emerging right from the edge. Holding the gown with the right side up, take a quarter inch step to the right and one quarter inch step back from the edge and insert the needle. Holding the needle horizontal to the fabric and pointing perpendicular toward the edge of the neckline, bring the point of the needle up right at the edge. Guide the thread under the needle as you pull the needle up and tighten the stitch. Continue moving a quarter inch to the right as you make each stitch. This stitch looks the same on the front and the back. VIKING BOX STITCH: This is made by working the Blanket Stitch away from the edge of the fabric or over a seam and finishing the open side of the boxes with Backstitch. Step 1: Complete one full journey with Blanket Stitch set back 1/2 inch from the edge. Step 2: Close the boxes with Backstitch using the holes that the boxes made in the first journey. stitch in a contrasting thread. the direction of the journey. HERRINGBONE STITCH: This stitch looks like a Cross Stitch but it is more closely related to the Backstitch. It is also called "long-armed Cross Stitch" and "Witch Stitch." Herringbone is worked on two imaginary lines on the fabric or over a seam or hemline. Practice on Aida cloth or draw lines with chalk or pencil on a scrap of linen to practice until you get the hang of it. Begin by anchoring the thread to the back and bringing the needle up between dot A and dot 1 in the chart above. Then make a horizontal stitch going in at B and out at A. Continue holding the needle pointing to the left. Now make a stitch that goes in at 3 and out at 2. Next one goes in at D comes out at C. This is just like an upside-down Backstitch that moves side-to-side. Keep the tension even and not too tight. Variations: Catch each cross in the Herringbone patterns with a small stitch in a contrasting color working in a side-to-side Backstitch. To create a wide area that looks like a net, work several rows of Herringbone next to each. For a strip that looks like decorative ribbon, edge each side with Backstitch in a contrasting color. There are many other variations for Herringbone. ARROWHEAD STITCH: This is my favorite! Some people call it Baseball Stitch because it looks like the stitching on a baseball. It needs to be worked on a seam to look right. Begin by anchoring the end of the thread to a seam on the backside of the fabric. Hold the garment so that the seam is horizontal to you. Push the needle up through the fabric on the seam line. Move a quarter inch to the right and above the seam and insert the needle perpendicular to the seam so that the point comes out one quarter inch below the seam. Pull through. Turn the needle so that it is parallel to the seam and pointing to the left. Insert the needle back in the begining hole so that the point comes out one half inch to the left. Pull through and you will see that you have made one arrowhead and you are ready to make another. Notice how you have made a cross on the back. Continue in this manner until you reach the end of the seam. Variations: You can vary the way it looks by changing the direction of the arrowheads every three stitches, changing the spacing between stitches, or changing the length and angle of the arrowheads. You can also work this stitch horizontally instead of stacked vertically to create a zig-zag. 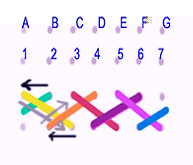 BUTTERFLY STITCH: Here is a fun stitch called the Butterfly Stitch. First, embroider two parallel lines of Backstitch with white yarn to establish a baseline. Space the butterflies one-stitch length apart using the baseline as a guide. Using contrasting thread sew three long stitches spanning border to border, then catch all three long stitches with a small stitch in the center and pull tight to draw the long stitches on each side together to form the wings. Metal thread, charms, and beads of all kinds have been found in burial sites in positions that indicate that they were sewn to the garments, so feel free to add them to your embroidery. Backstitch, Stem Stitch, and Herringbone were the most common stitches found on excavated Viking Age garment fragments. You can stick to those or add some of the many other variations. Based on what we know of native costume in other areas, we can assume Viking women continued to add more embroidery to their favorite garments every year. So, start with a little and keep adding. You can find a dictionary of embroidery stitches at Sharon Boggon's In A Minute Ago and at the other resources listed below. If you want to add this article to your list of favorites or email it to a friend, please use this permanent URL, https://stores.renstore.com/-strse-template/0710A/Page.bok. Permission is granted by the author to quote from this page or use it in handouts as long as you include a link back to Renstore.com.